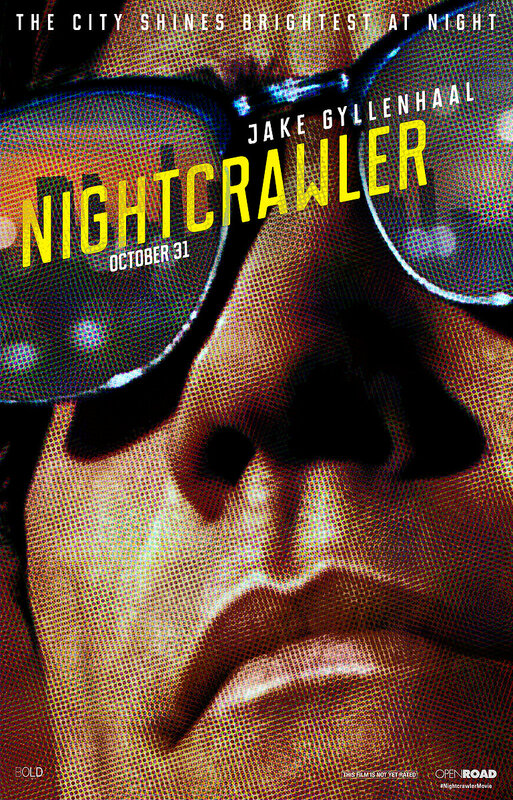 Ryan Gosling stars in “Nightcrawler.” Photo credit: Open Road Films. With slicked back hair, bug eyes, a gaunt face and a barely there smile, Jake Gyllenhaal (Enemy, 2014) is almost unrecognizable as Louis Bloom, an unemployed, single, loner who makes ends meet by stealing and reselling scrap metal and other random materials. He does what it takes to obtain these scraps, even if that means jumping barbed wire fences or beating up security guards. One night, Louis stumbles upon the scene of a traffic accident and notices independent news photographer, Joe Loder (Bill Paxton, Edge of Tomorrow, 2014), capturing every gruesome angle. Louis quickly has an “ah-ha” moment that this profession may be his calling. After stealing a mountain bike, he trades it in at a pawnshop in exchange for a used video camera and a police scanner. In no time, Louis is in his beat up car racing around the seedy streets of Los Angeles trying to beat everyone, even police, to the scene of crimes. Once Louis has a few accidents, robberies and fires under his belt, he takes his footage to a local Los Angeles TV station to sell. It’s not understood why he chose this particular station, but he seems to have an affinity for the anchors and especially for the news director, Nina Romina (Rene Russo, Thor: The Dark World, 2013). The cutthroat, rating-hungry Nina strangely grows a liking toward Louis, and they develop a working relationship. Louis hires Rick (Riz Ahmed, Closed Circuit, 2013), as his ‘intern,’ a young and unemployed 20-something who is in desperate need of money. As Louis’ video footage quality improves, and he continues to raise the station’s ratings, he ups the stakes and demands higher paychecks. It becomes clear that Louis will do whatever it takes to continually win Nina’s approval and obtain the ‘money shots,’ even if that means crossing lines, trespassing, lying to authorities and tampering with a crime scene. This incredibly dark thriller by first-time director Dan Gilroy is one of a kind. Gyllenhaal’s take on Louis Bloom is a whole new level of creepy. The small supporting cast (Paxton, Russo, Ahmed) is ‘normal,’ which reinforces the mystery behind Louis. Although different in their demeanor, Gyllenhaal’s creepiness level is almost that of Paul Danno’s in Prisoners (2013) – so eerie that you desperately try to look away, but simply can’t remove your eyes from the screen. The story is a frightening reminder of the disturbing reality that is modern society. Our thirst for shock and awe has reached new heights and those behind the scenes aren’t always going by the book. It’s disturbing to know that those conducting misconduct are still getting praised for their results. Louis’s lack of conscience and empathy is almost impossible to comprehend. While incredibly driven and pioneering, he wouldn’t give a second thought to taking advantage of the vulnerable. His passive aggressive personality can change at the drop of a hat and implode into utter anger. This, among many other aspects of the film, keeps us tense, shocked and paranoid. Bottom-Line? Nightcrawler is an edgy thriller that is certainly one of a kind and worth a watch. Gyllenhaal’s character is darker and creepier than ever, which may earn him an Oscar nod. The film is currently in limited theaters and will be available On Demand Jan.27 and Blu Ray Feb.10.